Members of Son La Province's multiple-choice exam marking team are being probed for “abuse of power,” police say. Tran Xuan Yen, deputy director of the northern province's education department and head of the exam marking team, and four members of the team were placed under criminal investigation on Tuesday for "abuse of power or position in performance of official duties." They are believed to have raised the marks for some candidates. Police have arrested three of the suspects, while the remaining two, including Yen, have been placed under house arrest. The probe into the actions of Yen and alleged accomplices are part of an ongoing criminal investigation into a national high school exam fraud that education inspectors had uncovered in the province. No information has been made available about probable inducements for committing the fraud. The fraud was uncovered after the exam results of Son La's 10,300 candidates were published on July 11. Many people were surprised to find that the province had a much higher percentage of students scoring 9 or more on a scale of 10 in Math and Physics. This was unusual because the scores were higher than in municipalities like Hanoi and Ho Chi Minh City that typically perform better in these subjects. As the public started questioning the results and in the wake of fraudulent results discovered in nearby Ha Giang Province, the Ministry of Education and Training sent a team of inspectors to Son La. Upon regrading 110 literature test sheets that had unusually good results, inspectors found that the original scores for 42 sheets were higher than what they should've been, 12 of them by as much as 4.5 points. They also found that many multiple-choice answer sheets were altered prior to being scanned and submitted for grading. In a report announced on July 23, inspectors concluded that Son La's national high school examination board had violated regulations in grading, storing and transferring the candidates' test sheets. Specifically, the board had copied scans of the candidates' answer sheets on to a CD disc without authorization and taken it out of the designated secured area. They also failed to properly secure the grading area and did not seal the room and boxes used for storing the candidates' physical test sheets, as well as the computer used for grading, as required. A criminal investigation into the case was launched on July 26, just a week after one in Ha Giang Province. 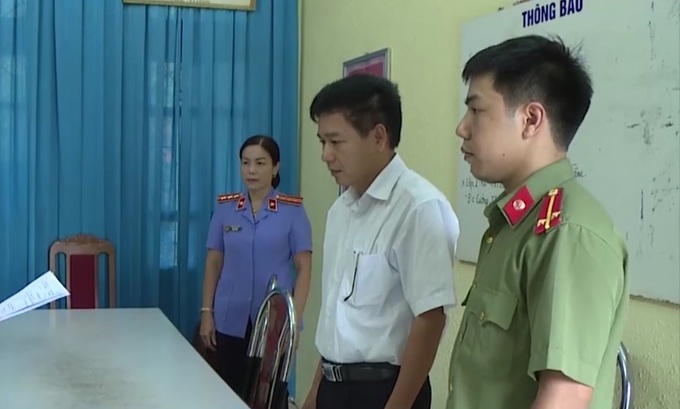 The investigation in Ha Giang has so far led to the arrests of two senior education officials. Vu Trong Luong, deputy head of the Testing and Quality Assurance unit in Ha Giang's Education Department was found to have heavily altered the results of over 330 test sheets belonging to 114 candidates to increase their scores. Luong's direct superior Nguyen Thanh Hoai was arrested for enabling Luong to commit his crime by giving him the key to the room where candidates' test sheets were stored.